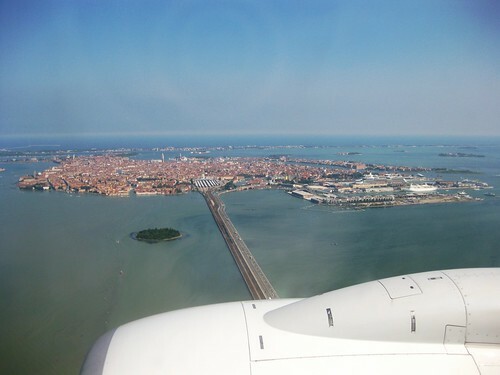 Riding on the right side of the plane flying into VCE (Venice Marco Polo Airport), we are treated to a lovely aerial view of Venice as we descend from west of the airport. After getting our luggage (just one suitcase shared between us plus two rolling backpacks), it’s a long walk through the concourse to the ground transportation desk. 5 euro per person, one way on the ATVO Express bus to Piazzale Roma, then a 16 minute wait for the bus outside terminal, 20 minute ride down Via Orlanda and over Ponte Della Liberta to Venice. 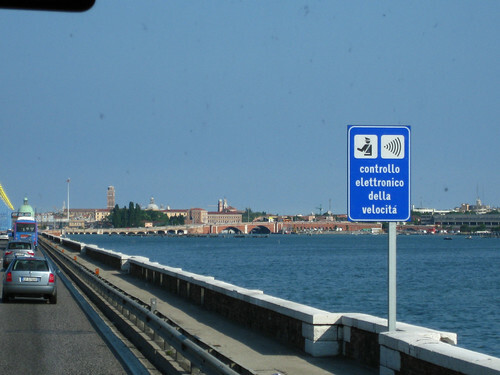 The bus is covered in a wraparound ad that makes the windows fuzzy but out the front I can see Venice draw nearer, the view marred only slightly by giant ships at the cruise port. (Can’t really complain; we’ll be sailing out on one of those ships soon.) Some kind of 1950s Beach-Boys-like music is playing anachronistically on the radio as we pull into Piazzale Roma. Venice guidebooks extol the virtue of getting lost, but I find the experience is overrated, especially when pulling luggage across high stone bridges after multiple wrong turns. We end up some distance into Sestiere Dorsoduro before I manage to get our bearings on an iPhone Venice map app and reorient us back towards our hotel along Fondamente Minotto in San Croce. We have a top floor room at Locanda Salieri, a cozy one-star located just beside (and above) Ristorante Ribot, just a few steps from Piazzale Roma if you know the route (which we now do). The room is of a livable size, with a high window overlooking a ledge overlooking a canal. It gets warm inside in the daytime, and the air conditioner only ever blows room-temperature air the whole time we’re there. I never figure out whether the AC is actually broken or if this is just standard European aversion to cold air conditioning, but this early in the summer it is enough to open the window at night. (It takes some time to figure out the mechanisms to unlatch the window and crank up the windowshade.) Locanda Salieri has fast, free wifi. This is good. But first, dinner. We cross Ponti dei Tre Ponti back to Piazzale Roma, over the recently finished Ponte della Costituzione (better known as the “Calatrava bridge”), past the Ferrovia (train station), and down a bit of the famous Lista di Spagna till we reach Brek, a self-service chain with good, cheap Italian food. 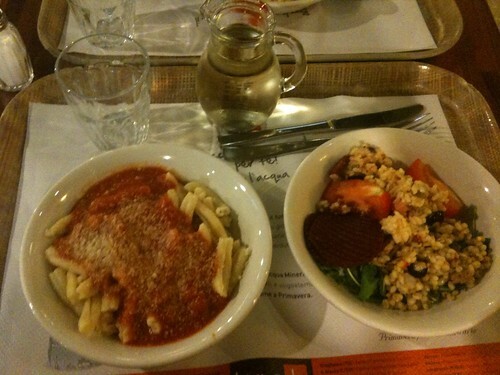 I know just barely enough Italian to ask for two bowls of penne al pomodoro, to eat with some salad and some house white wine, spouted into a carafe from a wine dispenser. My accent is awful, but the food is not. 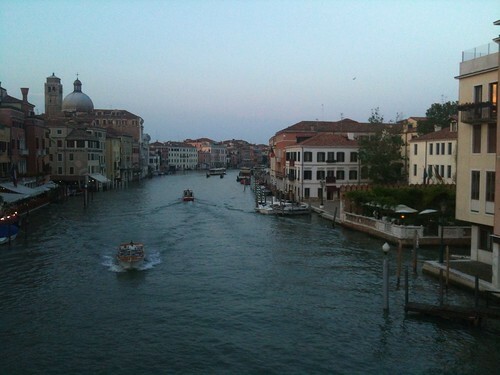 On the way back we cross Ponte degli Scalzi to look at the Grand Canal by the fading light. African vendors selling knockoff bags along the bridge give it a “New York Canal Street” ambience. As we cross the Calatrava bridge a fiery sunset colors the clouds over the lagoon. Something strikes me about Venice as we walk past the Ferrovia in the fading light: I’ve never been here and yet the city feels familiar to me, like I’ve lived here all my life. It all feels so familiar, so hospitable, so watery, and so walkable. Maybe that’s it: I’ve always felt more at home close to water, and in a place I can walk everywhere I need to go. 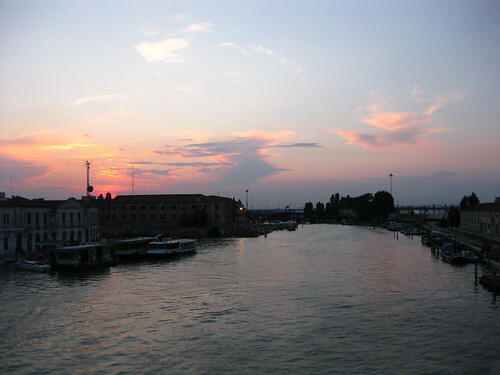 Or maybe it’s just that I’ve looked at so many Venice articles and travelogues and walkthroughs and photo albums that I managed to vicariously acclimatize myself to Venice before I’d even arrived. 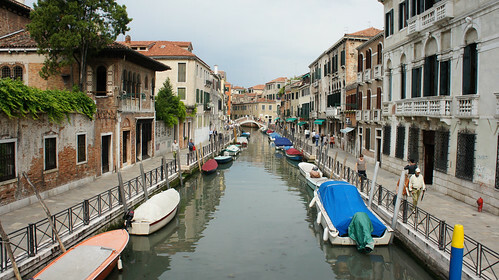 But I like to think of it more as Venice greeting me like an old friend. “Buona sera,” says the guy at the hotel desk, giving us our keys. Upstairs, the AC still blows only warm air. I unlatch the window and crank up the sunshade. The air outside is perfectly still, and Venice is quiet.